I wonder when that became a CNC operation? Because if you've seen an old square heel Jem, that's clearly not a CNC process. 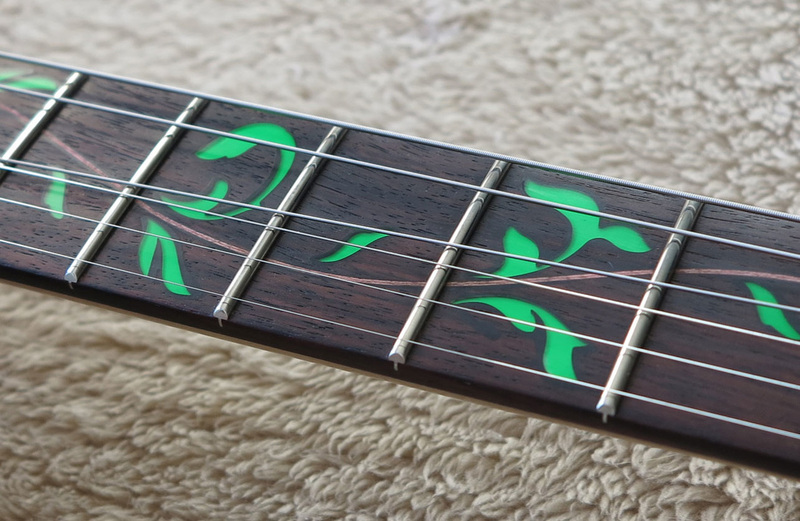 The only way to do a consistent vine inlay would be with a CNC pin router, doing it by hand using a template would be prohibitively expensive so I would imagine all but the very earliest LACS/MIJ guitars with a vine inlay have been through a CNC machine. Certainly absolutely everything Indo or Chinese is done on a CNC and I'd be amazed if Fujigen didn't get one pretty early on. If you got the extra cash and are happy I don't blame you. I was tempted myself on that one. The white with white pyramids is a great look. I just dig the green on black look - there's something extraterestrial about it. Sometimes I'm tempted to get the UV but one seven for me is enough, the cheap RG7321 I have. Which with Blaze pickups and the old high shoulder Gibraltar Standard 2 bridge is pretty good. I also have a 2010 RG7321 with the Gibraltar II bridge. 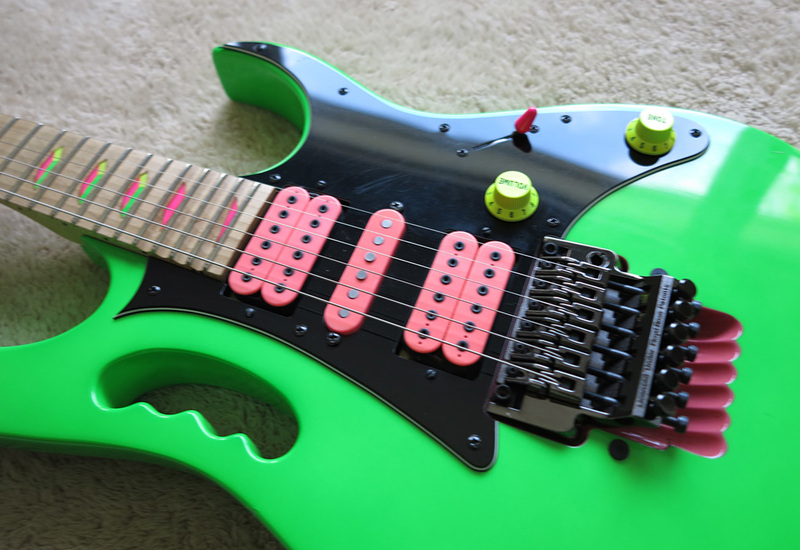 I also put green Blaze humbuckers in it and green knobs and switch tip as a nod to the original Universe guitars. I was blown away at the quality of that guitar for $400. 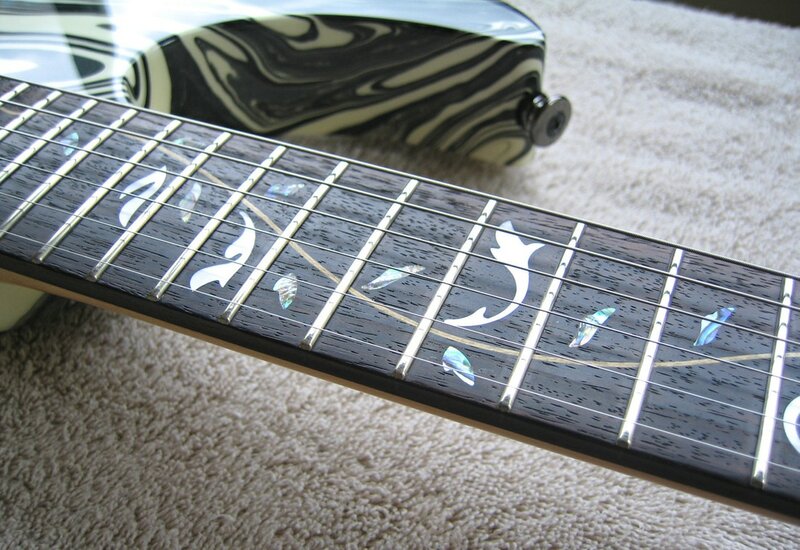 And it is the only 7-string I have or need. Honestly, I was very disappointed to see the JEM7VP introduced for 2019. If I wanted a white JEM with Gold hardware I would have already bought a JEM7V! My only frustration with my RG7321 is that I feel I should be able to play a seven as easily as I do a six. I was talking the scalloping. 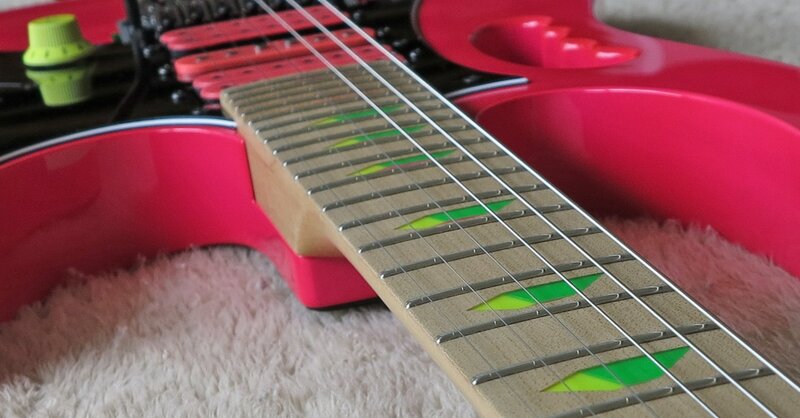 On early Jems it's extremely inconsistent, sometimes even fret-to-fret on the same guitar. The vines are pretty sloppily routed as well. On an FP or VBK, the green leaves are basically sitting in a lake of black epoxy. I think it actually works out to be a cool effect, but the routing is extremely sloppy. Pryamids were way neater for whatever reason. Guessing there was more hand work? Leviathus, froctavio and Hoseki like this. Angles are easier to route than curves? There's no way to make a sharp point with a router. My assumption is they undercut the pyramid and do the corners by hand. Ah. I thought they just used a smaller bit on the router. But it probably makes more sense they made a rough opening then filed the rest - especially in the 80's when CNC and such wasn't as good as it is now. It just looks like some of the tree of life curves are a PITA. Algiman, peromucho7 and pteropid like this. I played it in a working band 4 nights a week for 11 years. There was always something that just didn't set right for me with the JEM7V. I figured it was because the JEM was different from any other guitar I'd owned. In '10 I bough a 2009 RG370DX. Something about that guitar was right for me. I didn't realize what the issue was for me until the JEM70V SFG came out. I wanted one, but wanted to try one before any purchase. When I went to a store that had the JEM70V to my surprise they also had a JEM7V. I tried the 7V first to see if any memories would come back. The memories did come back, and I still felt something didn't set right with me. I tried the 70V and it was perfect. No mysterious issue. I couldn't believe it. I bought a 70V, it's my favorite guitar of all time. I took a guess and decided it was the 400mm radius that feels right to me (not the 430mm radius). I've since bought the JEM77P, and the JEM77WDP. I've already ordered the JEM7VP. For me this will be perfect. Yes I regret selling my '93 JEM7V. I don't think I need to spend $3,000 on a guitar. I thought of buying a new JEM7V, unitl the 2019 JEM7VP. Thank you Ibanez and Steve Vai ! 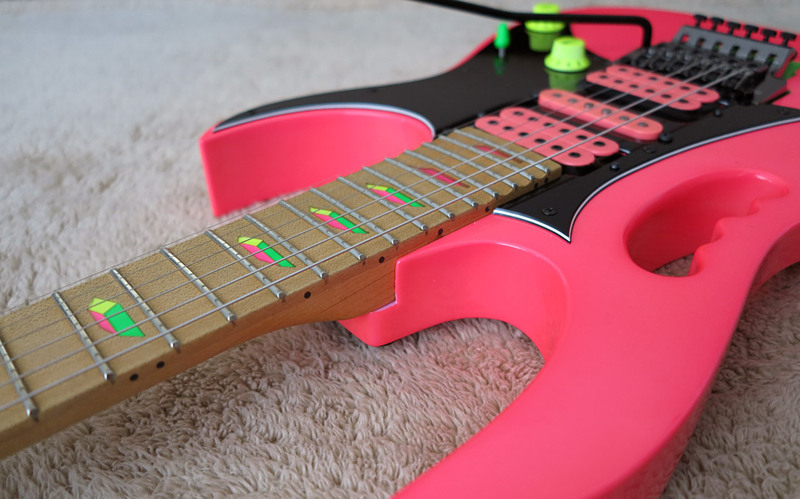 I personally like the Indonesian JEM guitars. I'm sorry. 400mm vs. 430mm Radius. YES ! I don't know what the fear is with a "lemon", but if I pay $1800 for a guitar it better be decent. and my JEM77P BFP has a strange anomaly whereas the pickup switch @ neck is capable of shorting and going "single coil". I've learned to control it. I don't want that mysterious neck pup "single coil" anomaly fixed. I wish more of them did it. LoL ! It is always amusing to see difference between people who can't and who can play. People who can't play are bothered by small dot under clear on back of top horn, line in poly, small nick here and there, constantly buying and returning guitar looking for perfection. People who can play are seeing guitars as instruments and not bothered buy trivial. And if it feels right it is right no matter what. SO I like this post. You're not alone here. I rather preferred the neck on my RG 920 to my Jem7v and RG2550. It is so amusing to see ludicrous virtue signaling posts like this that conflate whether someone accepts imperfections in expensive instruments can be a lead indicator as to whether they're a pro, or not. The biggest irony is that you can tell when people actually believe others have a right to their own view or not by how willfully they cast aspersions on whole groups of people like this. Thanks for turning the thread into some Liberal Sociological analysis by you. Sorry to have to be the one to point this out to you but that is EXACTLY what you did and you appear to have projected once again in perfectly describing your previous post. Let other posters like/dislike as they will and leave your leftist sociological analysis out of it. This was supposed to be a thread about JEM's until you tried to broadcast aspersions against anyone who feels it's okay to be picky when you're buying an expensive guitar.